Fourth and fifth graders in the new running club at Veterans' Memorial Elementary School in Gloucester set out on mile run Friday morning to celebrate the end of the fall season. At front center, wearing shorts, is fourth grader Jadyn Elwell. Immediately to the left of Jadyn is his classmate Abdi Bartolon, who went on to finish first in the run with a time of 7 minutes, 10 seconds. To the left of Abdi is fellow fourth grader Jazayah Sainterling. 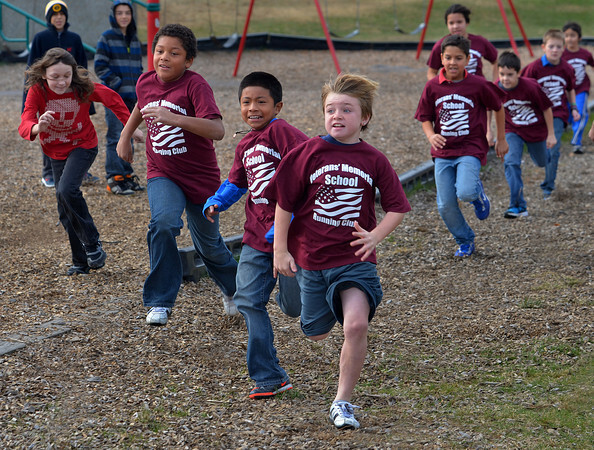 The new running club met once a week this fall and will begin again in early April. "The whole idea is to teach kids to take care of themselves for the rest of their lives," says Principal Matt Fusco, a regular runner who started the club not only to promote better bodily health, but because studies have shown that regular physical exercise also helps sharpen the mind. Students at Veterans' Memorial have taken to the new club with gusto. "I'm so proud of them," says Fusco. "It's good to see them try so hard."